No need to look any further for Outback Steakhouse menu prices! Outback Steakhouse is an Australian-themed casual dining restaurant that serves mouthwatering steaks, grilled chicken, ribs, and fresh seafood. Don’t forget to start your meal off with some Aussie-style appetizers. Outback menu offers diners two ways to prepare their steak – seared or flame-grilled. No meal is complete without dessert. And with Outback’s large dessert portions, you can share with your guests. You must be thirsty by now. Check out their list of beers, wines, cocktails, premium spirits and specialty drinks. Below are the latest Outback Steakhouse menu prices. What’s New at Outback Steakhouse? You can rest assured that if you give an Outback Steakhouse gift card it will not be re-gifted. Your choice was awesome! You can send a custom Outback Steakhouse gift card via postal service or you can send an e-gift card. E-gift cards can be ordered anytime and are delivered to the recipient’s email inbox almost instantaneously. Outback Steakhouse does not accept reservations but you can call ahead or go online and request to have your name put on the waitlist. Make sure to specify the time you plan to arrive. Most Outback Steakhouse locations are open for Lunch & Dinner. Outback Steakhouse is doing its share to make healthy eating possible when you visit. Before your next visit to Outback Steakhouse, check out their nutrition calculator, where you can pick your favorite food items and get all the nutritional facts. Low-calorie diets should not stop you from visiting Outback Steakhouse. Their Under 600 Calories menu options are full of flavor and taste delicious. With the help of registered dietitians, Outback Steakhouse has put together a gluten-free menu using their fresh ingredients including, steak, seafood, and chicken. Sign up with an email address and Outback Steakhouse will send you special discount offers all year round. Thanks, Mate! Don’t have time to visit the restaurant or planning a family night at home and still want to enjoy Outback’s great dishes? Select a favorite location, order online or via a mobile device, and select the time for pick up. Simple. Easy. Done. No need to worry about washing dishes. Become an Outbacker! Join Outback Steakhouse and watch your life get better. Outback Steakhouse is always looking for fun-loving, talented individuals that enjoy interacting with people and not afraid to work hard. Take a look at the list of current openings or learn more about the benefits of working at Outback Steakhouse. Four veterans of the hospitality industry came together with the intent of opening a restaurant where diners could get a quality meal, served by a team of passionate professionals. In 1988, that dream came true. 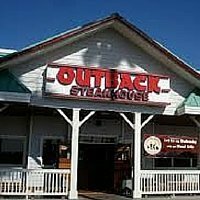 The first Outback Steakhouse opened in Tampa, Florida. For more information about Outback Steakhouse, please visit their official website. What is in the Outback Steakhouse clam chowder? Outback Steakhouse does not share the recipes of their dishes. What menu items are vegan at Outback Steakhouse? Outback Steakhouse does not offer alternate lifestyle menu options. Customers should speak with the restaurant manager upon arrival for any special food requests. What are the Lunch and Dinner hours at Outback Steakhouse? Outback Steakhouse hours of operation are between 4:00pm-10:00 pm. Select locations do open for Lunch at 11:00 am. It is recommended that you contact your local Outback Steakhouse location to confirm hours of operation. Are Outback Steakhouse fries gluten-free? Outback Steakhouse fries are not gluten-free. Outback does offer alternative gluten-free potato side dishes. You can check out the choices by visiting the Outback Steakhouse official website. Who owns Outback Steakhouse and where are they headquartered? Outback Steakhouse is a wholly owned subsidiary of Bloomin’ Brands, a publicly traded company, headquartered in Tampa, FL, that owns several national restaurant chains. There are currently over 950 Outback Steakhouse locations in 23 countries. You can connect and follow Outback Steakhouse through various social media platforms. I wish that you had your drink menu on here. I love the Wallabedarned. That is my favorite and I order it every time I go to an Outback Steakhouse. Every time Outback changes their menu, the variety gets better while the value gets poorer. One of the big attractions for customers in the past were a nice chilled salad and a side item like a baked potato. Now you have to pony up and additional $7 for both not including the entree. Getting too pricey for a family these days. Really pricey. Bought 2 $20 gift certificates for my wife. Should have gotten Cracker Barrel or even Pizza Hut. I prefer meals with an upfront price for entree and 2 sides. To order a pop and a steak and it sits alone on a plate…too cool! The steak comes with a side and a soup or salad. Outback is a restaurant, Pizza Hut and Cracker Barrel are quick serve there’s a difference. Quality poor….potato soup watery, salty..no potato in it…we’ll done hamburger… burnt…hadn’t eaten there in months due to poor food…won’t be back..poor management to serve bad food…heard same from family in New Mexico. Food was great. We will certainly be back. I love the Outback Restaurant in Sanford Fl. The owner is the nicest person, very helpful if a problem does arise. 5 stars all day. We stop there when we get off the Amtrak Train or before we get back on the Train. Auto-Train. Food delicious every time. With my Mom’s passing we wont be going down there anymore but I want them to know everything was perfect every time we were there in our travels! Last year we went to The Outback for dinner. We had not been there in a few years as we live out of town. I ordered a steak with salad with Ranch dressing. My lips were burning after as couple bites of salad. The waitress said they put cayenne on everything. My steak was crusted with cayenne. No place did we see on the menu that this was common nor if we had as choice on this practice. It would have been nice to have known. Not a fan of overkill or over use of this seasoning. my husband had shrimp, same seasoning. Not going back anytime soon. Used to like the food but not so much now. We saw the ad for special steak and lobster for 14.95. Waitress said that was the corporate price but Kennewick price was $ 18.95. We eat out quite a lot but not going to be there. Where are the drinks like sodas how much do they cost? like what’s having steak without having soda or water? My father and I go to outback two or three times a year food and service are always good.and with the economy prices always go up and down its to be expected . R U open on Thanksgiving Day? They do not offer lunch specials on the weekend either–all lunch specials cost more on the weekend! We were at outback the other day I ordered the prime rib dip sandwich and the meat was like shoe leather and cold very unsatisfied. And my girls steak was well done not medium as ordered not impressed. JIM. Boycott Outback Stake House!! If you buy a gift card there they will not honor it. I know, seems unbelievable but it is not. If your gift card that you paid for is over a few months old Outback Steak House will keep your money and tell you the card is no good to your face. Do not give these crooks your money. They do not deserve to be in business! Oct 6 2018 Very disappointing, had dinner there and ordered stake and all you could eat shrimp. We got 4 on our plates . We asked for more shrimp, after waiting for over 1/2 hour I just paid and left.